For directions to Boston College, visit the Directions and Parking page. Visitors should always adhere to posted signage and consult the Transportation and Parking website to clarify any university parking rules or regulations. Vistor parking is located in the Commonwealth Garage (Levels 3-6) and Beacon Garage (Levels 3-4). See the map below. Pay stations for the Commonwealth Garage are located on the first and fifth floor elevator lobbies. In the Beacon Garage, the pay station is available on the second floor next to the exit. More detailed information is available on the Transportation and Parking Services website. From the Mass. Turn Pike (Heading East): Take exit 17. Take first right onto Centre Street. Follow Centre Street for approximately 3-5 minutes. From the Mass. Turn Pike (Heading West): Take exit 17 and follow all the way around the rotary (left) and take first right onto Centre Street. The Newton fields and the Quonset Hut are accessed from the main gate of the Newton Campus off of Centre Street. After turning into the gate, proceed straight past Hardey and Cushing Halls and turn right before the Trinity Chapel. After driving down the hill, turn left and the fields and Quonset Hut will be on the right. The Newton fields and the Quonset Hut are accessed from the main gate of the Newton Campus off of Centre Street. After turning into the gate, proceed straight past Hardey and Cushing Halls and turn right before the Trinity Chapel. After driving down the hill, turn left and the fields and Quonset Hut will be on the right. Visitors should always adhere to posted signage and consult the parking and transportation website to clarify any university parking rules or regulations. 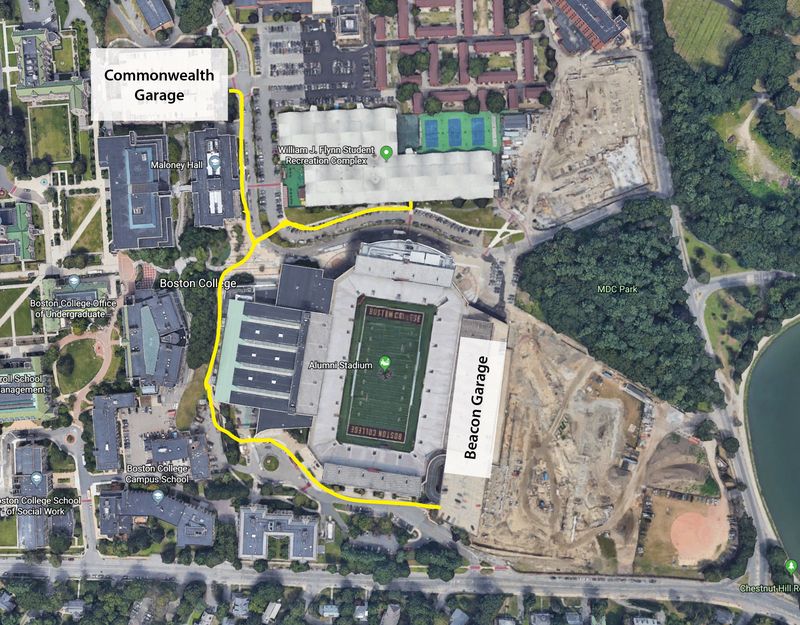 From Downtown Boston: Follow Commonwealth Avenue to St. Johns Seminary (Enter on the 4th Right after Foster Street). Follow the road until you see the parking area on your right. The field to your right is St. Clement’s field and the field ahead and to the left is the Lake Street field. View the Brighton Campus map for details. From Points West: Follow Route 9 into Brookline. At the Brookline Reservoir turn south onto Lee Street, which merges with Clyde Street; continue to the end. At the traffic lights, turn left onto Newton Street and follow for about 1/4 mile to Boston/Brookline town line. Watch on the right for distinctive tan stucco buildings with red roofs. Take right onto St. Paul's Avenue, a private way, and proceed to the appropriate entrance. From Boston: Take the Jamaicaway to Jamaica Pond; continue past Jamaica Pond and take Pond Street on the right at the set of lights. Continue up Pond Street which becomes Newton Street after entering Brookline. The School’s distinctive tan stucco buildings and red roofs are immediately on the left. Take a left onto St. Paul's Avenue, a private way, and proceed to the appropriate entrance. From the Southeast: Follow the Arborway or Center Street rotary at the intersection of the Jamaicaway. At the rotary head north toward Jamaica Pond for one block, get in the left lane and loop around as if heading south, and take your second left onto Pond Street. Continue up Pond Street which becomes Newton Street after entering Brookline. The School’s distinctive tan stucco buildings and red roofs are immediately on the left. Take a left onto St. Paul's Avenue, a private way, and proceed to the appropriate entrance. From the South: From Interstate 95 (old 128 N) take the Route 1 exit east at Dedham. Follow Route 1 which becomes the VFW Parkway to the intersection of Independence Drive located at the Westbrook Village Shopping Plaza (Bertucci’s and CVS) and Harvard Pilgrim Health Center on the left in West Roxbury. Turn onto Independence Drive at the set of lights and continue through the rotary at Putterham Circle onto Grove Street. Grove Street becomes Newton Street at the set of lights at the Exxon gas station. Continue straight on Newton Street and through the next set of lights where Clyde Street is on the left and Allandale Farm is on the right. Continue on Newton Street to where it becomes Pond Street at the Brookline/Boston town line. The School’s distinctive tan stucco buildings and red roofs are immediately on the right. Take a right onto St. Paul's Avenue, a private way, and proceed to the appropriate entrance. From Boston: Take Storrow Drive West towards Newton. Storrow Drive turns into Soldiers Field Road at the Boston University (BU) Bridge. Continue on Soldiers Field Road towards Newton. After passing the IHOP restaurant, at the intersection with North Beacon Street, Soldiers Field Road becomes Nonantum Road. You will see the boathouse once you pas the bridge! Continue on Nonantum until you reach the boathouse entry, on the right. From Mass Pike (From West, Heading East toward Boston): Take Newton exit 17 off the Mass Pike. You will go up the ramp, past the Sheraton Hotel (which is located directly over the Mass Pike). Continue past the hotel until you see a sign for Charlesbank Road. Bear left onto Charlesbank Road and follow this road onto Nonantum Road. Enter onto Nonantum Road going East. On your left, pass the Newton Yacht Club, then the DCR Daly Skating Rink, and playing fields. The Community Rowing Harry Parker Boathouse is the next left.